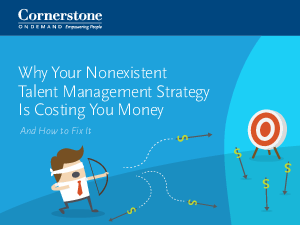 Research shows time and time again that organizations without a true talent management strategy are losing money. When talent management is relegated to siloed systems, e.g., spreadsheets for recruiting or performance management, organizations can’t access the wide range of information crucial to making strategic, longterm decisions around their human capital. The cost of lost opportunities alone—failing to attract and engage top talent; losing high-performance employees for a lack of engagement, training, and career development planning; wasting time managing poor employees—can result in lower profits, and worse, even the inability to survive in an economic downturn.